Both were delicious but, in my opinion, the Skipjack is better. The Skippy has better texture and more pronounced flavor. By the way the Skipjack fights a A LOT harder than the Blackfin! 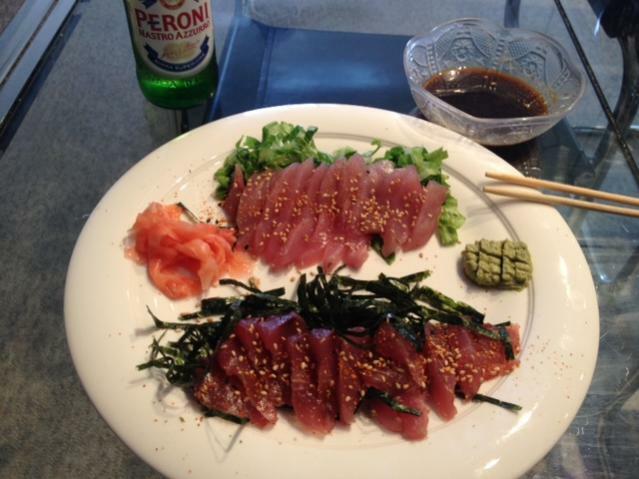 The skipjack is the lighter colored sashimi on the plate? what a pronounced difference in the color of the meat! Actually, the Skipjack is the darker colored sashimi sitting atop the shredded nori on the bottom of the plate, the BFT is the lighter colored sashimi sitting on the shredded romain on top. 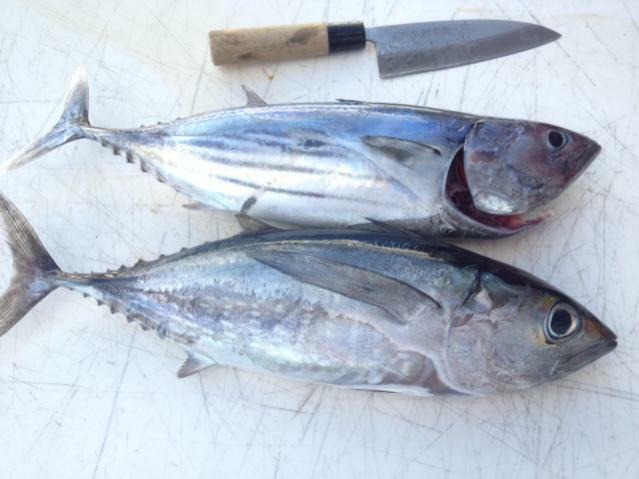 Yes, there is a big difference in color, texture and flavor....Skipjack rules! after reading thru and drooling over several of your beautiful recipes i would like you to give this a thought. Yes, many many years ago, off the Pacific side of the Baja peninsula I kept a skipjack and tried it the same way you eat it and it was delicious. I don't know how many hundred skipjack we've released but after eating that one we occasionally kept one. Your dish looked a lot better than mine but it probably tasted the same.